Please consider helping me share our new film Inside Darkness and promoting thoughtful dialogue before the election in one or more of the following simple ways, two of which will earn you a complementary DVD. 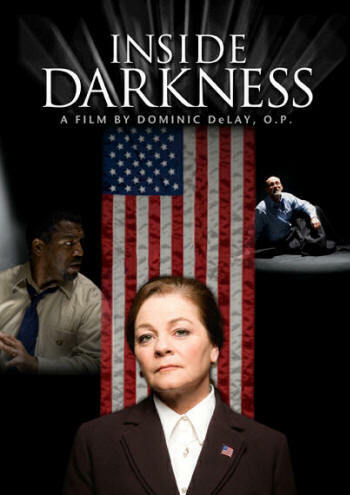 Inside Darkness is a 35-minute suspense film about three presidential candidates who awaken in a dark cell. The DVD includes probing interviews and discussion questions. You can watch not only the trailer but also, if you sign up for the free members' area, the first nine minutes of the film, all at www.InsideDarkness.com. 1) ORDER YOUR OWN COPY of the DVD. The offer of 30% off has been continued. Check out the suspenseful and provocative trailer to Inside Darkness, about three presidential candidates who awaken in a dark cell: www.InsideDarkness.com. Inside Darkness, the new political thriller from Father Dominic DeLay, O.P., Mud Puddle Films, and the Western Dominican Province is currently available for over 30% off. This suspenseful and provocative movie is about three presidential candidates -- one Catholic, one evangelical, and one agnostic -- who awaken in a dark cell. Visit InsideDarkness.com to watch the trailer and the first nine minutes before ordering your DVD. Check out the suspenseful and provocative trailer to Inside Darkness, about three presidential candidates -- one Catholic, one evangelical, and one agnostic -- who awaken in a dark cell: www.MudPuddleFilms.com. I'd be happy to return the favor with a link to your site and a complementary copy of the DVD. Perhaps you and your friends have your own websites as well. 5) HOST A SCREENING. I'd be happy to send you a complementary DVD. You can utilize the discussion questions and interviews on the DVD, as well as the online discussion guide. Also, Inside Darkness has a page on a really cool website called Brave New Theaters that enables you to share your screening with friends you haven't met yet: http://insidedarkness.bravenewtheaters.com/account/login. To add to the fun, you might even wish to coordinate the event to precede or follow one of the debates, scheduled for September 26, October 7, and October 15 (the Vice Presidential debate October 2). I'd be happy to attend any such screenings if I'm available. Thank you immensely for seizing this timely preaching opportunity.